Katie Keszey, CCVStudents, staff, and community members gathered last week for CCV-Winooski’s annual International Food Festival. Musakhan was a sort of flatbread, the crust soft and spongy and spread with a light glaze of sumac, onion, and spices. Big chunks of chicken were the main feature, decorated with pine nuts and fresh herbs. It was sweet, hearty, and a little smoky, like it had just come off the grill. Like traveling to a street fair halfway around the world while carrying the comfort of homemade Friday-night pizza. This is just one of CCV alumni Richard Witting’s contributions to last week’s International Food Festival in Winooski. Witting attends the gathering every year with his company, Firefly Catering. This time around he prepared dishes from “unrecognized regions”: Alongside the musakhan was rogan josh, a goat curry with rice, and khudat with cheremsha, a mixture of polenta, leeks, and feta—from the cuisines of Palestine, Kashmir, and Chechnya. Students and other community members shared portuguese soup, sambusa, Spanish rice and beans, cheese puffs, bitter leaf soup, goi cuon, spicy chicken noodles—from Portugal, Mexico, Nigeria, France, Vietnam, and Nepal. 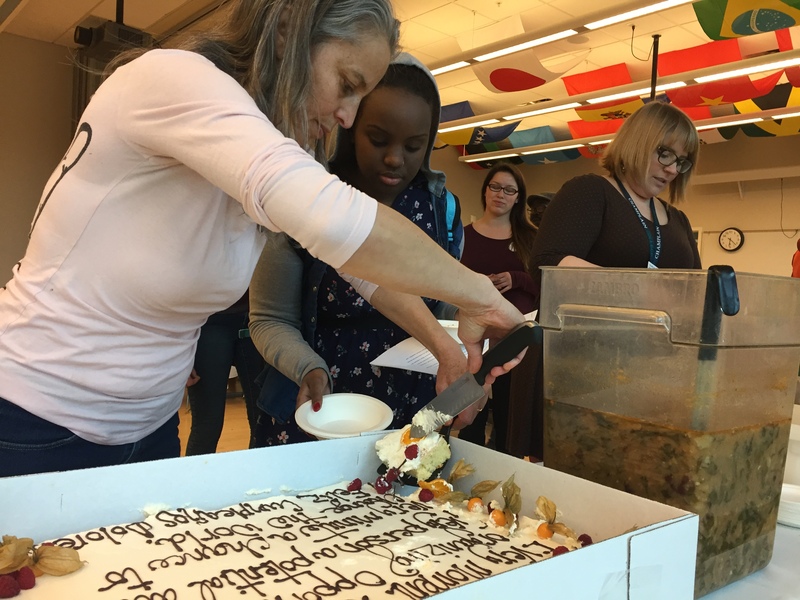 2019 marks the 19th consecutive year of CCV-Winooski’s tasty tradition, which also always includes music and dance from around the world. Coordinator of academic services Dave Amsden is a committed volunteer at the event. He says that while CCV defines diversity broadly—more than half of students are the first in their families to attend college; many are Pell-eligible; many are high school students, or veterans, or single working parents—the racial and ethnic diversity of students is also expanding. In the past two years, CCV-Winooski has enrolled students from more than 120 different countries of birth. In the last year, roughly 15% of the student body at that academic center self-reported as multilingual, and more than 1 in 5 identified as a racial or ethnic minority. And those numbers are double what they were ten years ago. Linda Bassey, who is working toward a CCV degree in human services, stood proudly behind a table spread with bitter leaf soup, cornmeal cakes, rice, and spicy beans—all of which she had made, all of which comes from her home country of Nigeria. She says she likes cooking for others, and she likes good food, and she wanted to share.